Biographical Information: George was born in Portsmouth, Hampshire on 10 October 1914. He was the eldest son of Caleb Lewington, a coastguard, and his second wife Agnes. George had an elder half-brother and elder half-sister, and two younger brothers and a sister. Both his father and his grandfather John had served in the Royal Navy, as did his two younger brothers, Norman and Ronald. George is known to have attended The Nicolson Institute in Stornoway at ages 13 and 14. He later attended the Royal Hospital School, Holbrook in the late 1920s/early 1930s, and joined the Navy immediately after leaving school. He was married early in 1940 to Edna Dean. George was present in H.M.S. Hood during the engagement with the French at Oran in July 1940. He spoke fluent French and served as messenger to Force H's commander, VADM Somerville during that time. 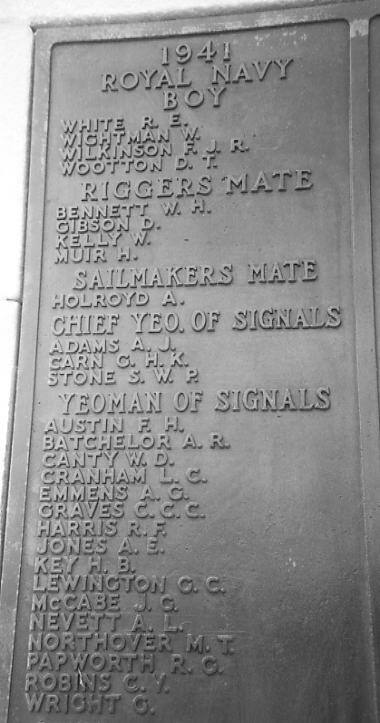 George was serving as an Acting Yeoman of Signals (Temporary) and was 26 years old at the time of his loss. Below- The official notice of condolence received by George's family following the war.